Is The History of Gettysburg More Than a Collection of Facts? I am about half way through and I am thoroughly enjoying the book. That said, for a book this size I have no doubt that there are factual mistakes. How can there not be. The battle is a major event that has been poured over by historians. There are people who have devoted years of study to the battle as a whole and/or to various moments during the battle. As a result it should come as no surprise that this book will be picked apart tooth and nail, by folks whose understanding of specific aspects of the battle outstrip Guelzo’s. I am not suggesting that it should not be. Who is going to deny that getting the facts right is important? The author may, indeed, have mistakenly placed Two Taverns on the Taneytown Road or referenced Jubal Early as commanding three brigades instead of four. Like I said, there are factual mistakes in just about every history book. 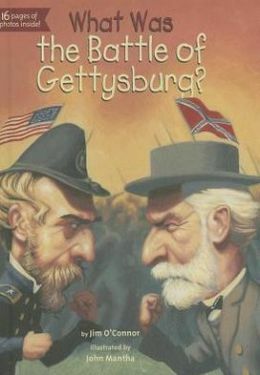 What I am wondering about, however, is whether the release of a new book on the battle of Gettysburg is simply another opportunity to run through a checklist of facts and accepted profiles of the standard list of characters. Is there room for interpretation in a battle where there is so much emphasis placed on such excruciating factual minutiae? Is the history of Gettysburg more than a collection of facts? Informal questioning to several friends, as well as my own reaction, question not so much Dr. G’s statements of fact (though from the above it’s apparent you and I share at least one Facebook friend) as his linking of what he considers George Meade’s views on George McClellan, slavery, and Republicans and his performance as commander of the AotP at Gettysburg. I personally find his argument unconvincing, for whatever my opinion is worth. But I suppose any new, comprehensive Gettysburg study at this point must have a hook. Dr. G is good with the pen, and I think in this anniversary year lots of folks will read the book. A visit to B&N will show you it ain’t hard to find! There are certain places in the book that bear a noticeable absence of secondary sources that shape the broader interpretation at work here. In other words, there are places in the book where I think the interpretation is lacking, but that is a step back from worrying about every single fact and characterization. At some point it just becomes a game and an incredibly mind numbing one at that. BTW, I just happened to cite that specific Facebook thread because it kept reappearing. I don’t mean to pick on anyone in particular. In fact, this is someone that I have the utmost respect for given his work at Gettysburg. I’m glad not to be an historian, but I can interpret what I see the way I see it. That’s why facts and stats mean very little to me. I prefer to look at history selfishly: what’s in it for me? It’s the ultimate marketing question that some would say marginalizes and trivializes what really happened. On the contrary, I believe taking my viewpoint forces so-called buffs to relate their facts to me in a way that means something to me. And why not? Shouldn’t we learn from what our ancestors did by imitating the best of what they did? That’s why I wrote Gettysburg Lessons In The Digital Age and turned the fist part of it into the beginnings of a DVD series. Try to find an author who puts on video what he puts on paper. It’s not happening in an age where we are more dependent of what we watch, not on what we read. I plugged my book and DVD – very selfish of me, I know. But maybe, just maybe we can take a radically different perspective of history and find its golden and invigorating lessons right under our noses. I haven’t read the book yet, but I can’t imagine it is just a collection of facts. There are so many perennial debates surrounding the battle, and Guelzo has to address them. My hope is that Guelzo puts the battle in the broader context of the war as a whole–that’s where many studies of individual battles have fallen flat. I wasn’t suggesting that the book is simply a collection of facts, but that we should not judge it simply as such. I have only just gotten the book but upon opening to a random page saw the wrong Maine regiment in the wheatfield. Turned to the devils den section and found John instead of Augustus van horn Ellis and that four instead of three of smith’s cannons were captured. You are clearly inclined to enjoy (and dare I say apologize for) this book and I hope to enjoy it as well. The key for me is whether mistakes are simple typos or whether they represent a lack of understanding about the topic at hand. If there are ten errors, OK perhaps. If there are 80, what then? I can accept errors in movies that inspire people about the topic I hold dear but a full length battle treatment cannot be afforded the same leeway. Kevin you pounce again an again on people who spout incorrect black CS facts so I’ll look forward to seeing whether and why in this case solid writing should trump historical accuracy should the errors prove to be 80 of significance. For my part, so far I am having the most trouble getting past the back dust jacket flap. Sorry Dr. Guelzo! Thanks for the comment. First, I suggest that you go back and reread the post. At no point do I suggest that historians ought to be given a free pass for incorrect facts. How can I be clearer on that point? As I stated, I assume there are going to be mistakes in a book this size about a battle that has been studied to death. I also assume there are mistakes in other Gettysburg books such as Coddington, Sears, Trudeau, etc. No doubt, some mistakes are more important than others depending on how they effect the overall interpretation. The point of the post was to pose a question, which I thought was pretty clear. Let me use the black Confederate topic as an example since you brought it up. The problem for me is not simply that factual mistakes are made, but that they stem from a highly problematic understanding of slavery and race relations in the South and the Confederacy. It is in that sense that I am posing this question. Can we evaluate traditional battlefield studies as more than simply a collection of facts? I still await your answer on this. I am going to steer clear of your suggestion that I am “apologizing” for Guelzo. This post isn’t even really about Guelzo at all. Thanks, bro. Cool with me, Man. My observation is that this and another post about the book is apologetic in nature. It simply comes off that way, to me, even in re reading it. You even seem to qualify the two taverns and early mistakes. And yes we can evaluate battlefield studies as more than a collection of facts. Context, results and meaning are more important than the actions but any conclusions drawn must be tempered by how accurate are the facts in the book. There is no escaping that. That’s my point. If a book is riddled with error (and I only suspect but don’t know if this one is) any interpretive conclusions therein are all but meaningless to me. Sure there are mistakes in other full length studies (and to be sure in my Gettysburg work) but in coddington I would never come upon three important errors in five minutes of perusing. No way. Sears or trudeau, unlikely but possible. These dudes demonstrated an understanding of the topic that earned them the right to draw conclusions, although only Coddingtin really did. This is fun but I’ll probably be off line for a time…. I don’t even know Guelzo so I really have no reason to be apologetic or unnecessarily favorable to anything he writes. There are aspects of this book that I really like and other things that I find problematic. For instance, this is very much a top down book. We get some very colorful descriptions of high-ranking officers, but not much that penetrates the experiences of the enlisted men. I don’t mean simply that the descriptions are not as lengthy or that there are an insufficient number of soldier quotes, but that the rich secondary literature that has evolved in recent years is nowhere to be found. Of course, this gets us beyond the ground level of counting facts. Thanks for the follow up, Garry. Looking forward to seeing you next month. Let’s not forget our 4 minute video. Kevin Levin and Garry Adelman–two gentlemen whose passion for Civil War history I greatly admire. But 2:23-3:35 a.m.? Get some sleep, guys! Kevin’s right–the time stamps were way off…. and correct, I hate sleeping more than 6 hours!